Slowly but surely, esports are gaining more attention on consoles - thanks primarily to established AAA franchises. 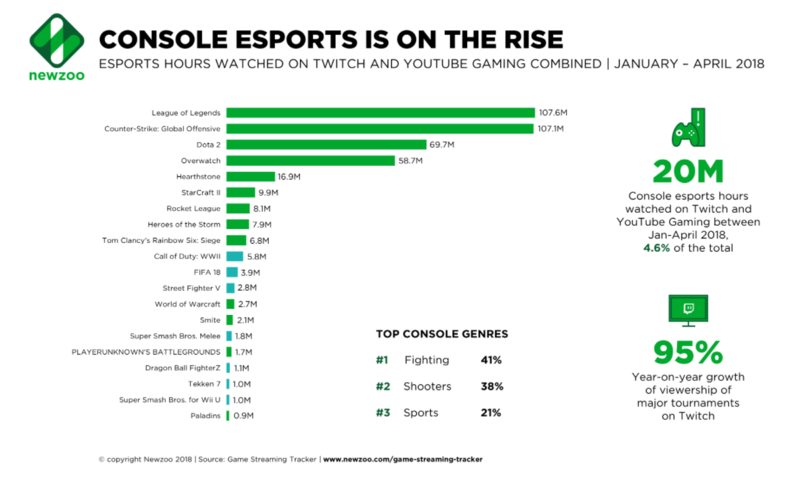 The latest report from Newzoo reveals that more than 14.1 million hours of major console esports events have been viewed on Twitch since the year began, growing to 20 million overall when you include YouTube. The Twitch figure is 95.5 per cent higher than the same period (January to April) in 2017. Newzoo notes that this growth - almost double the viewing figures - has not been driven by an increase in the number of events. Last year there were 43 major console esports events (defined as those with a cash prize pool of at least $5,000), whereas there have been 46 so far in 2018. The biggest events were identified as two FIFA 18 Ultimate Team Champions Cups, the Call of Duty World League, and the Halo World Championship. These four tournaments accounted for around half the total viewership hours. Of these, Call of Duty was the most popular, accounting for 5.8 million hours, following by FIFA 18 at 3.9 million. Call of Duty and FIFA were among the seven console-only titles in the Top 20 most popular esports games Newzoo recorded for January to April 2018. After these two, Street Fighter was third most popular with 2.8 million hours viewed. Other titles in the rankings included Dragon Ball FighterZ, Tekken 7, Smash Bros on Wii U and GameCube title Smash Bros Melee. This being said, console titles had a larger presence in the overall esports rankings when you take into account multiplatform games such as Overwatch, Rocket League and Rainbow Six: Siege. Unsurprisingly, Blizzard's shooter is the most popular with 58.7 million hours, although it was outperformed by three PC-only titles: Dota 2 (69.7m hours), Counter-Strike GO (107.1m) and League of Legends (107.6m). While console tournaments are helping to raise awareness and grow the audience for esports on these devices, they remain a fraction of the overall esports ecosystem. For the combined esports viewing of Twitch and YouTube for the first four months of 2018, console events only accounted for 4.6 per cent of the total hours.